A lot of houses in Wiesbaden have some fascinating doors. Like this building in the Westend. Please click on the image for a larger view to better see the details. Both doors have "Salve Amici" (welcome friend) written on it. Those are fabulous doors! wow!! And I like the welcome inscribed upon them! They are beautiful! More please. bob - funny comment! I didn't check on that but assume they use regular sized ones :). sam - thanks! That's what I liked too. Great photo. In my home town I have not noticed any ornate doors. Your post will lead me to watch for them. I do remember in Charleston South Carolina the doors were very ornate on the historic homes and that there was meaning in the carvings which outlined them. Wow, I want a front door like that. unique! Those doors are just amazing!! Is this a retrospective architectural style used these days or a style that has survived from the time it was built? 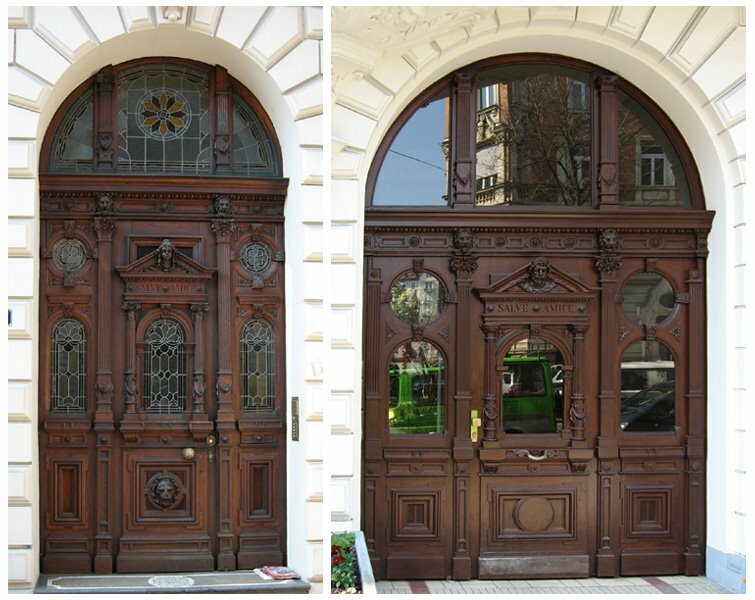 Very ornate craftmanship on these doors gives them a very antiquated aristocratic style. They have an iconic European flava as seen through my eyes, although the "welcome" seems Latin? Great doors. The one on the left has the "Salve" and the ugliest gargoyle below. Maybe the owner didn't want friends bringing their children. Great and interesting photo. They are beautiful doors. More of that Roman influence, I guess. Thank you all for your great comments here!! denton - looking forward to them! ndiginiz - I think these are quite original doors. As you can see, the door on the left is in better shape and even has the windows decorated as well. Looks like they didn't make it in the larger door. fraser - I've been wondering about these faces. I've seen them all over the city on doors and facades. I hope at some point I'll find someone to explain them to me. ggraph - :) I've heard about this "method" to remind guest not to forget their keys. Funny anectdote - thanks for sharing!